Is Marketing Cloud Right for You? Explain how evolving technology and customer expectations are impacting the marketing industry. Identify the products that make up Marketing Cloud. We're in the midst of a Fourth Industrial Revolution—where artificial intelligence, robotics, and the Internet of Things (IoT) are transforming the customer experience. With each of these new technologies comes a new wave of data signals. And as marketers, we need to be able to capture and make sense of all that valuable data in order to deploy intelligent marketing strategies. Disconnected data sources and departments make synchronizing all the channels that much more difficult. Luckily, this is where Marketing Cloud can help. In the age of intelligent marketing, customer engagement is not just about marketing. That’s why Marketing Cloud is part of the Salesforce Customer Success Platform, the only platform that enables companies to manage customer engagement across the complete journey: marketing, sales, commerce, and service. This module is all about helping you understand what Marketing Cloud is and how it can support both your organization and your customers. Let’s start with the basics. 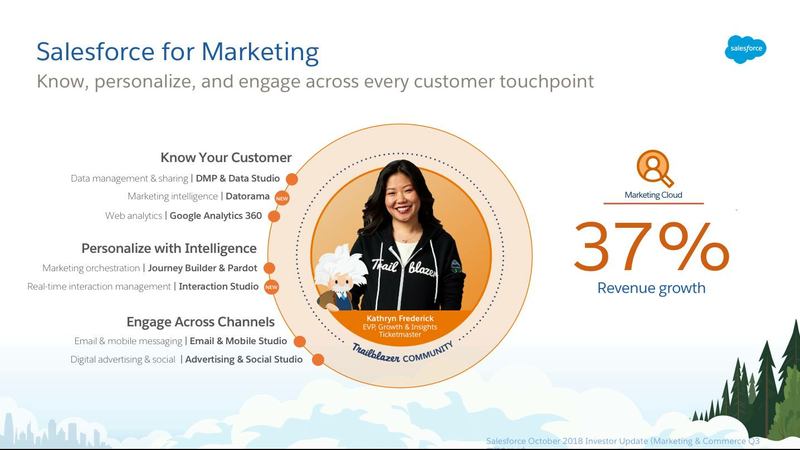 Salesforce for Marketing is built on the world's #1 CRM platform. It enables you to know your customer, personalize with intelligence, and engage across the entire journey. It’s the only integrated customer engagement platform that enables you to deliver personalized customer engagement at scale on every channel, from email to web, mobile, social, and digital advertising. Marketing Cloud covers it all. Connect known and unknown profiles to gain a unified view of the customer. Leverage data and Einstein artificial intelligence to make every interaction relevant. Create two-way, real-time engagement when and where the customer wants. Measure, report, and optimize on marketing performance, impact, and customer loyalty. Check out this short video to see Marketing Cloud in action. You’ve learned that Marketing Cloud empowers you to know, personalize, and engage across every customer touchpoint. Now let’s take a look at the individual products. Audience Studio Capture data from any source and device, then unify, segment, and activate audiences to create valuable customer experiences. Expand your reach with a data sharing platform where publishers can share 2nd party data with marketers in a trusted and transparent way. Enable cross-platform marketing intelligence by unifying data sources, visualizing AI-powered insights, and creating actionable reports to drive ROI. Gain cross-channel insights for seamless customer journeys with Google Analytics 360 + Marketing Cloud. Deliver cross-channel personalized experiences at every step of the customer lifecycle with campaign management. Visualize, track, and manage customer experiences with real-time interaction management—driving valuable engagement at the right moment. Use data from every department to build smarter email—from basic marketing campaigns to sophisticated 1-to-1 messages. Send consistent SMS, push, and chat app messages in real-time. Use CRM to securely power 1-to-1 advertising across Google, Facebook, LinkedIn, Twitter, Pinterest, and Display at scale. Listen, publish, and engage to create customer advocates. Connect social to marketing, sales, and service in one platform powered by AI. You don’t have to be a big company to use Marketing Cloud. Whether you’re a marketing team of one or 100 (or 1,000), Marketing Cloud can help you grow your company. If you want to target one or two particular channels, such as email or mobile, then Marketing Cloud can help you do that with Email Studio and Mobile Studio. You don’t have to use the entire suite of products all at once—use only the products that meet your needs. Think about how you want to engage your customers. Where are your customers? What’s the best way to reach them? What level of customer interaction are you looking to achieve? Marketing Cloud sends over 1.5 billion emails a day. Let that sink in for a moment. That’s 1.5 billion targeted, personalized, and engaging emails every day—that’s the opposite of spam email. But do you need to reach your customers through other digital channels? We call that cross-channel marketing, and we have just the products to help you—mobile, social, advertising, and the web. However, for organizations that sell and market through large partner networks, such as franchisees, financial advisors, insurance agents, or resellers, it’s a challenge to deliver seamless customer engagement at scale. Distributed Marketing from Salesforce makes it simple for brands to deliver consistent experiences across corporate marketing and local partners networks—all on the Customer Success Platform. To answer that question, let’s ask a different one: Do you need to reach your individual customers in a more personalized way, at scale? If the answer is yes, then Marketing Cloud is not only right for you, but we built it just for you! When customers spend money on your products and services, they enter into a relationship with you. You want to build and cultivate that relationship to drive trust, loyalty, and ultimately increase lifetime customer value. Marketing Cloud can help you build those relationships with your current and prospective customers, users, and subscribers. Whether you’re trying to identify new customers or cultivate existing relationships, you can use Marketing Cloud to connect to your customer through email, mobile, social, advertising, and the web—all in one place. Create a complete customer journey with automation and analytics powered by Salesforce Einstein artificial intelligence technology. Read on to find out what it means to seamlessly engage customers across the entire journey by connecting marketing, commerce, service, sales, and communities.